This time of year we start planning for next season and considering new equipment that may improve our productivity next year. So many choices! What can you suggest? In an earlier career, I managed a program that advised industrial clients on capital expenditures for pollution prevention. They typically used payback analyses to pick between competing options. 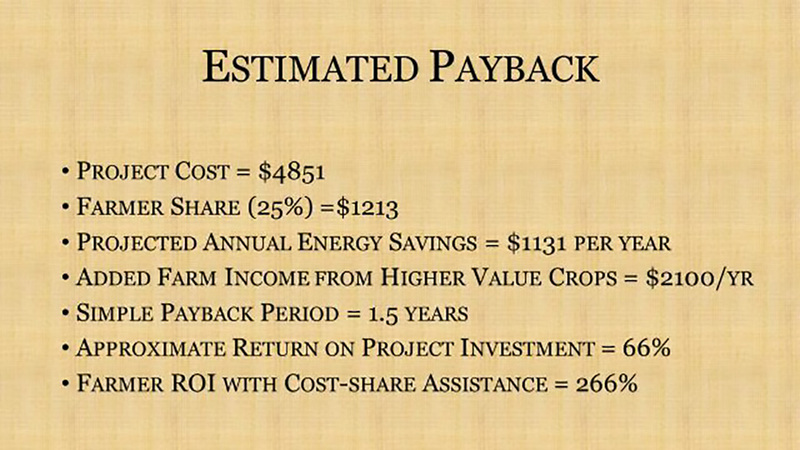 A simple payback analysis is the cost of the change divided by the savings per year. The result is the number of years needed to pay back the initial investment. For example, a $200 investment which saves $100 per year, pays for itself in two years. If we divide two years into one, the simple return on investment is 50% per year. On the farm, investments continue to pay back as long as the equipment lasts—perhaps twenty years in some cases. Twenty times $100 is $2000 or ten times the original cost. Payback can also be used to compare different types of investments. Do we hire a part-time worker at $5000 per year or buy a new weeder attachment at $2000 or plant a half acre of Asian pears at $5500? In farming, an investment can reduce costs or increase productivity or (hopefully) both. I have included an example from a report we submitted to ECAP. We bought a used greenhouse frame several years ago and covered it with a single layer of used plastic. It provided another month of season at each end working as an unheated hoop house. The improvement we were considering improved the energy efficiency of that structure in several ways—double glazing, perimeter insulation, and movable thermal curtains. an ability to grow higher value, more productive crops (squash instead of kale, for example).